Company archives take up space. You may store your records in a closet or storage room, or you may have an ever increasing number of filing cabinets housed wherever they can fit across the office. As your company grows and expands, the storage space required for your files will continue to increase, but rather than cramp up the office with more physical files, you have other options. Document scanning is often turned to when the amount of files in an office starts to pile up. While document scanning is a neat, organized, and reliable way to free up office space while maintaining careful records, it can be expensive. Document scanning costs around 7-12 cents per page (depending on the image quality you require, if you need items scanned in color, if you need double sided pages scanned, etc.) which can add up quickly. If you just have a few thousand pages the job can be done quickly and affordably, but if you have hundreds of thousands of pages to scan, it will be a large financial commitment. If scanning is too expensive for your current situation, a great alternative is offsite document storage. Offsite document storage services store your files offsite in large, secure warehouses. Documents are secure and available to you 24/7, and the cost of offsite storage is far less than the cost of scanning your files. On average offsite document storage costs around $0.19 per cubic foot per month. 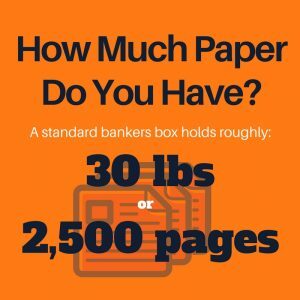 You can fit around 30 pounds (or 2,500 sheets) of paper in 1 cubic foot. At this price point you can store your files offsite for 76 years for the same price it would cost to scan them. And it’s important to remember that documents need to be sorted and shredded once they reach their required retention period for security purposes, which will help offset the influx of new documents that would have otherwise required additional storage. Need a Better Records Management Solution? Every company manages records—what sets you apart is how well you do it. You can make document management a stressful, complicated process, or you can find a solution that automates most of the work. Record Nations wants to help your company reach a place where document management is easy. We partner with professionals across the U.S. and we’ll help you find the solution that best meets your needs. Call us at (866) 385-3706 or fill out the form on the right and we will get you several quotes on document management services that will help your company be more efficient.